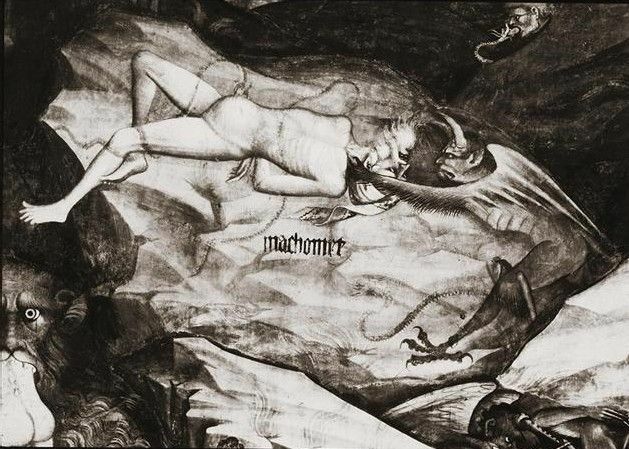 Medieval and Renaissance Christian and secular artists had no religious restrictions regarding depictions of Mohammed, and were free to show his face and body in their entirety. Illustration depicting a schematized Mohammed from an early medieval Latin translation of the Koran, from a manuscript in la Bibliotheque de l'Arsenal, in Paris. This may be the earliest known depiction of Mohammed, possibly dating from the mid-12th century. 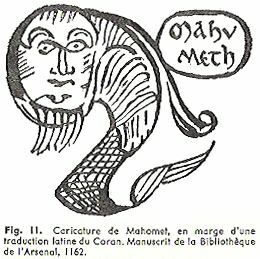 This reproduction is from the book Naissance de l'Europe, by Robert S. Lopez (published 1962) (taken from Deux traductions latines du Coran, by Marie-Therese D'Alverny [published 1948]). 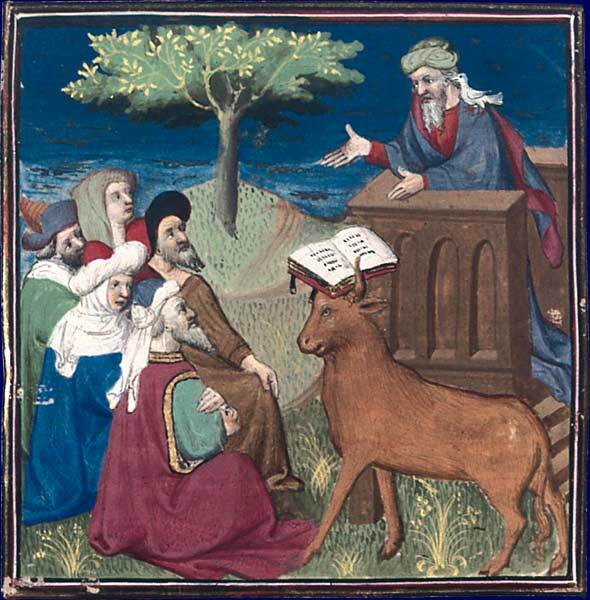 Mohammed preaching, with historically inaccurate landscape and clothing (a common problem in medieval and Renaissance paintings, which usually showed fashions contemporary with the time the painting was made, rather than costumes of the era depicted). Illustration ca. 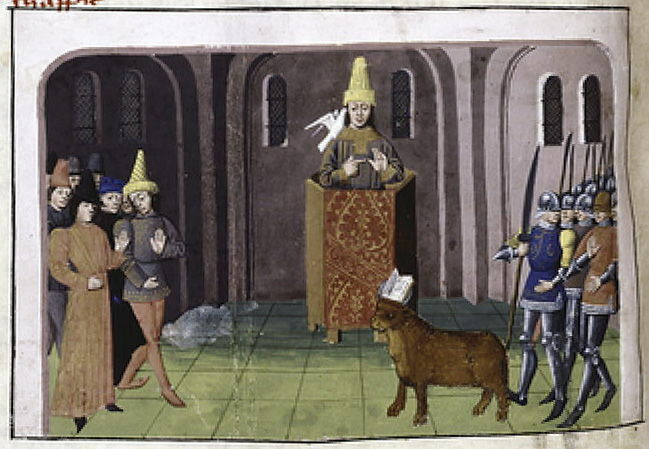 1400-1425, taken from Boccaccio's De Casibus Virorum Illustrium (early 15th-century French translation by Laurent de Premierfait); drawn by the "Master of Rohan." 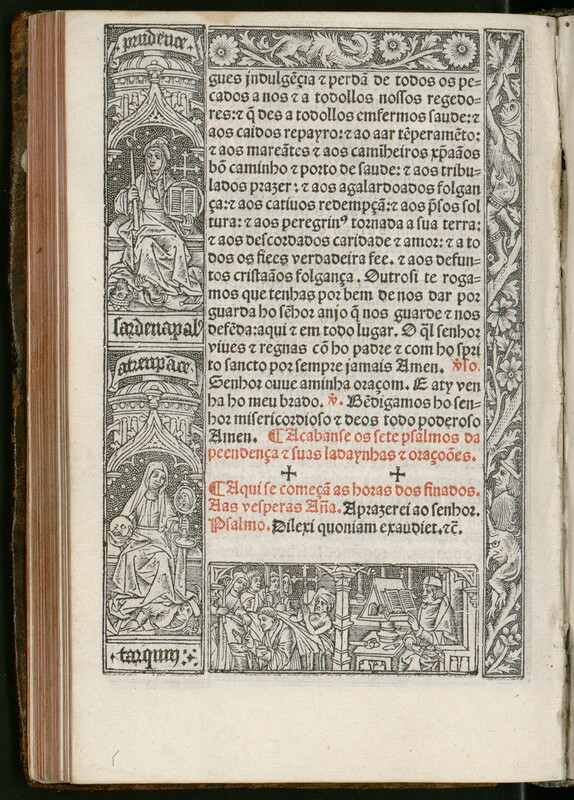 The manuscript is currently in the Bibliothèque Nationale de France. 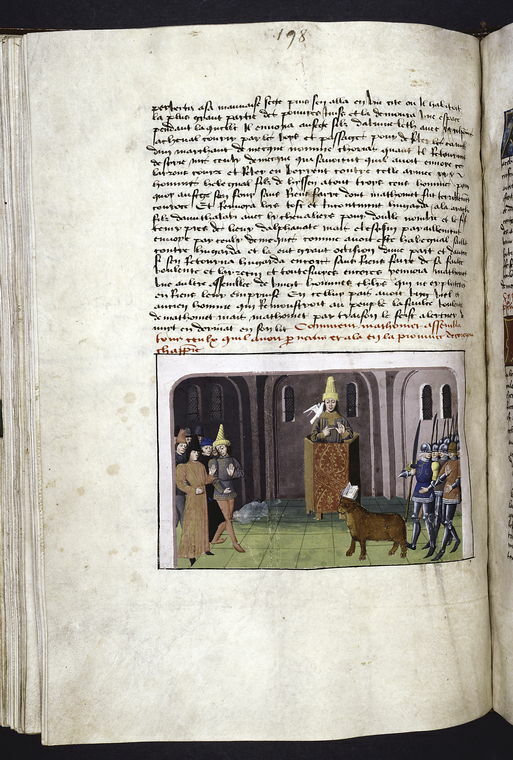 The same illustration in the context of its manuscript page can be seen here. According to the iconography of the time, the dove on Mohammed's shoulder indicates that he is a false prophet trying to convince his listeners that he is associated with the Holy Spirit (of which the dove is a symbol). 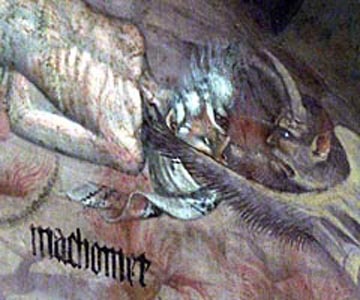 This picture is of an early Renaissance fresco in Bologna's Church of San Petronio, created by Giovanni da Modena and depicting Mohammed being tortured in Hell. In 2002, Islamic extremists plotted to blow up the church in order to destroy the image. The fresco is in an inaccessible part of the church and is now only visible at an angle from a distance; this old black-and-white image is one of the few official photos ever taken that shows a straight frontal view of the figures. 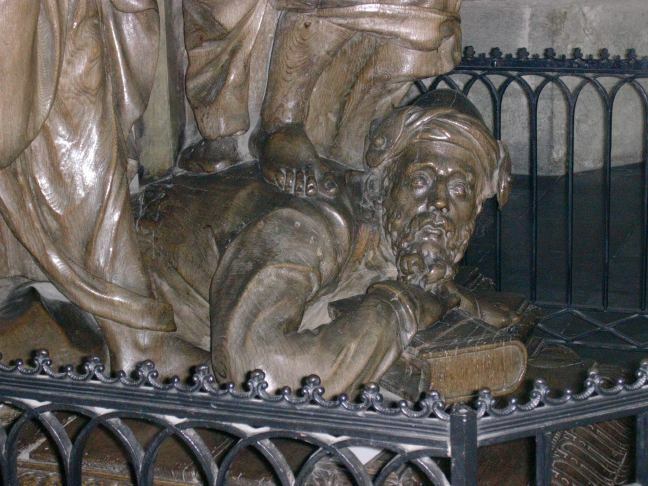 This wooden sculpture in the Church of Our Dear Lady in Dendermonde, Belgium depicts Mohammed on the ground, clutching the Koran, being trampled on by angels. As first reported at The Brussels Journal, "The sculpture represents the triumph of Christianity over Islam." It was carved by the 17th-century sculptor Mattheus van Beveren. 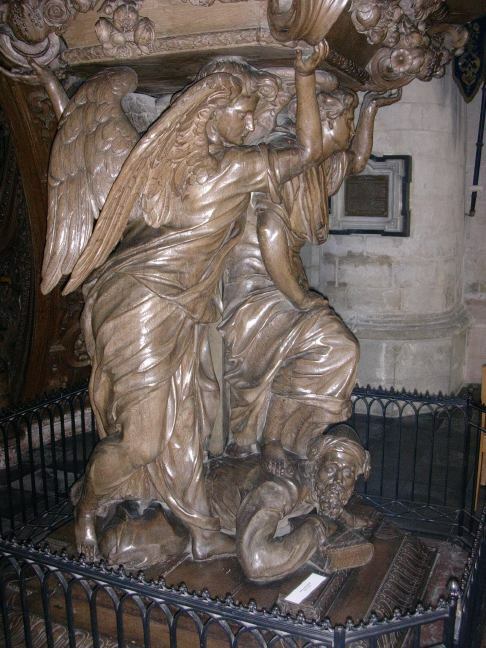 This photo shows the entire sculptural group, with the angels holding up the pulpit as they stand on Mohammed. 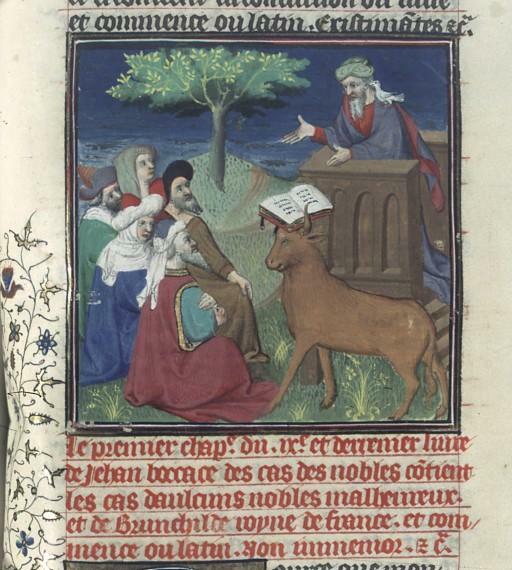 The handwritten manuscript known as the Chroniques Martiniennes, made in France in 1475, contains this miniature painting of Mohammed preaching while wearing European-style early Renaissance-era attire. As with other portraits of him from the period, the presence of the dove indicates that he is a false prophet. In the collection of the New York Public Library, from which these images were taken. 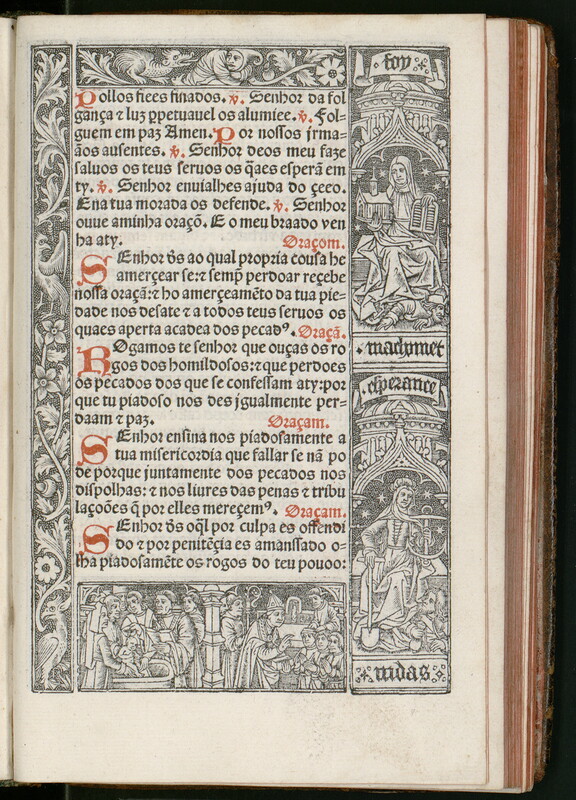 The full manscript page, with the painting in context of the handwritten text, is on the left; and on the right is a low-resolution close-up of just the painting from the full-page image. 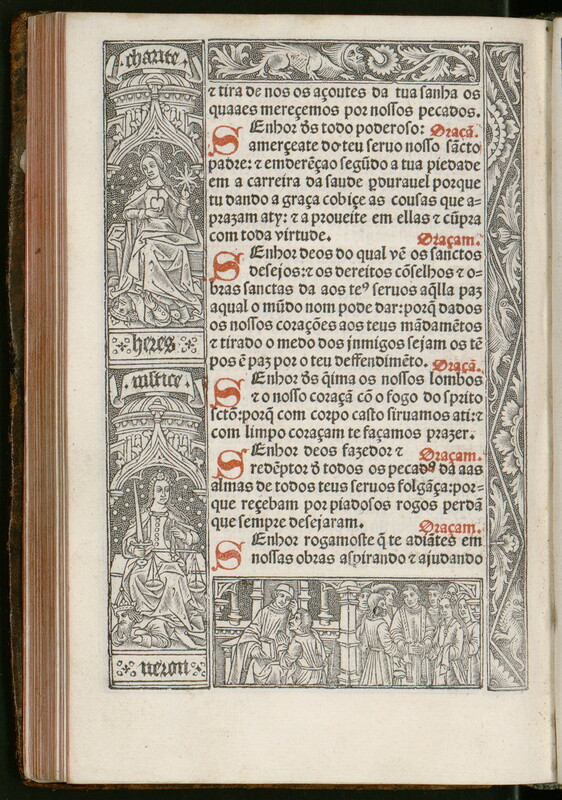 Although the library's catalog listing for the image says it was created in "1475 (Approximate)," the notes for it say "De Ricci dates this to 1458, the year it was translated for Louis de Laval. Notes in dossier give the date as ca. 1461," so it could be from slightly earlier than 1475. An earlier scene of Mohammed being trampled was depicted in this ca. 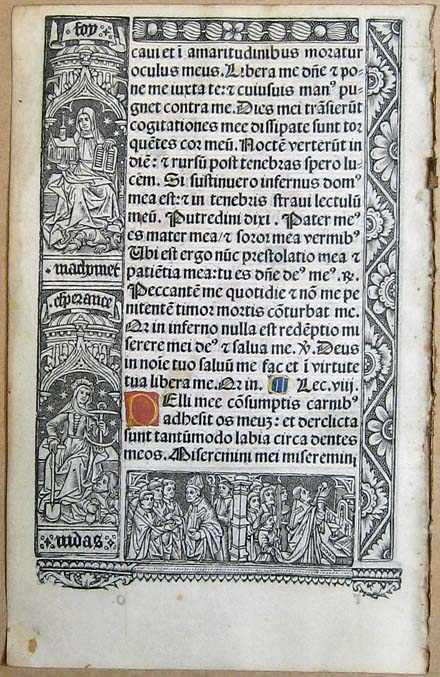 1500 woodblock print, which was used and reused in various liturgical books of the era. 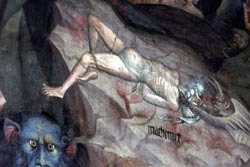 It shows the allegorical Faith ("Foy") stepping on Mohammed ("Machomet") who presumably represents heresy or disbelief. 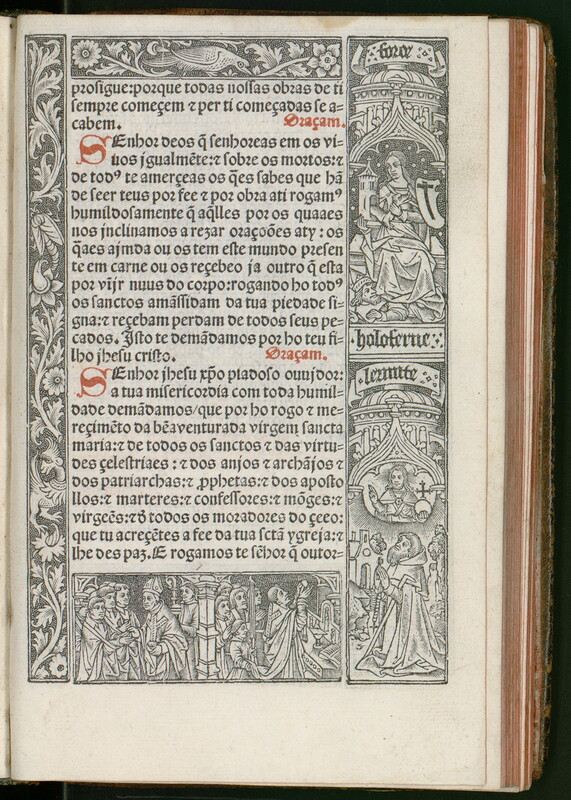 The image on the left shows a closeup of the print, while the one on the right shows another version of it in context on a manuscript page. A full series of images showing the traditional Virtues stepping on historical tyrants can be found here (including Faith stepping on Mohammed), here (Justice stepping on Nero), here (Force steps on "Holoferne") and here (Temperance steps on Tarquin). 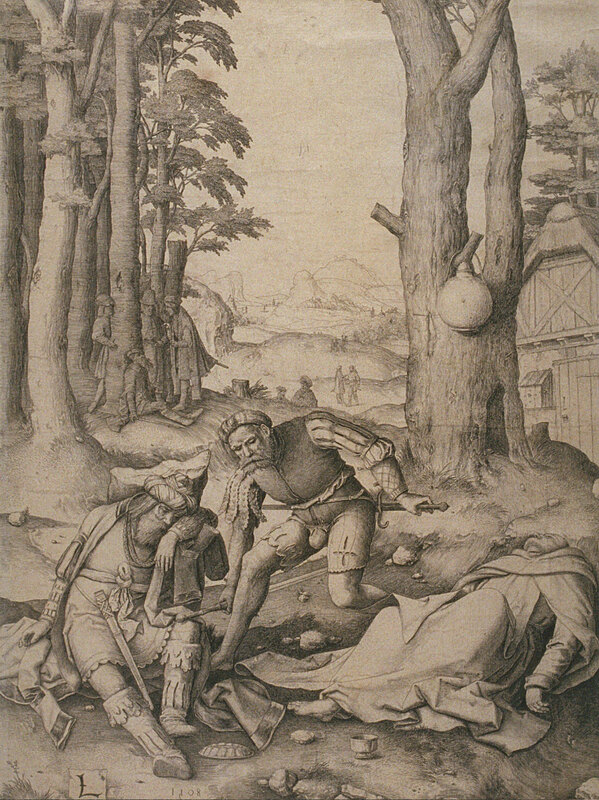 This 1508 engraving by Dutch artist Lucas van Leyden illustrates a legend about Mohammed that circulated in Europe during the medieval era; according to a 1908 New York Times article which reprinted this image, "The famous print of the year, 1508, is an illustration of the story of the Prophet Mohammed and the Monk Sergius. Mohammed, when in company with his friend Sergius, drank too much wine and fell asleep. Before he awakened a soldier killed Sergius and placed the sword in Mohammed's hand. When the prophet wakened the soldier and his companions told him that while drunk he had slain the monk. Therefore Mohammed forbade the drinking of wine by his followers." A high-resolution reproduction of this engraving can be viewed here, and a museum catalog listing giving all its specifics is here, which states the current location of the print as the Fine Arts Museums of San Francisco. 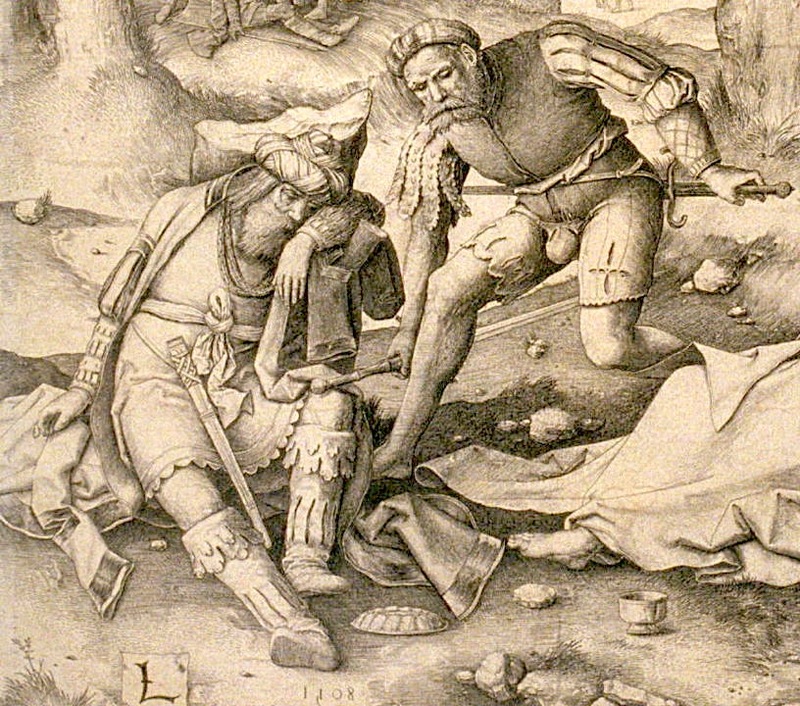 Here's a close-up detail of the same picture, showing Mohammed asleep on the left and the soldier on the right placing the sword on his lap. Notice, as usual, Mohammed's anachronistic and culturally inaccurate clothing. 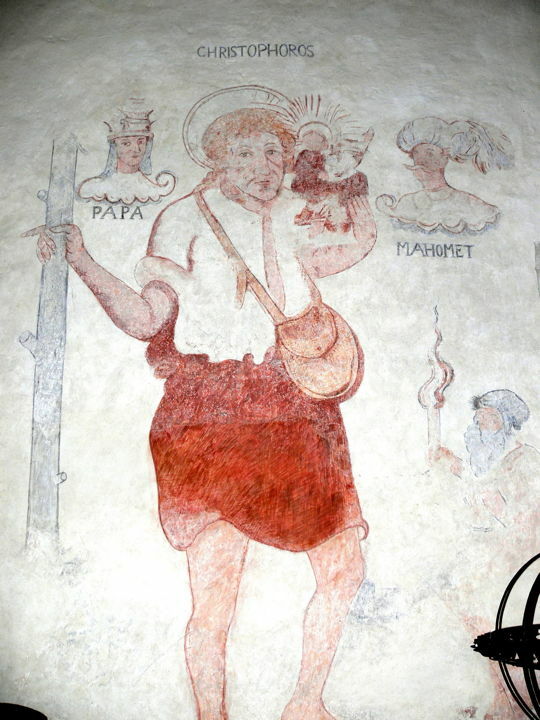 The church in the town of Gothem on the Swedish Island of Gotland features this wall painting, which depicts (from left to right) the Pope, St. Christopher, baby Jesus, and Mohammed. According to this scholarly paper (pdf file), "An early example of how Muhammad was used in the early reformation comes from a wall painting in the Gothem church on Gotland (an island situated on the East coast of Sweden).... The painting depicts St Christopher, Jesus as a child, the Pope and Mohammad. St Christopher caries the child on his shoulder, saving it from the water in which the Pope and Muhammad perish. How do we understand this painting? The propaganda is directed towards Catholicism. The drowning, nameless pope is humiliated by being associated with Muhammad and Islam; the false prophets perish together." The author of that paper, Professor Jonas Otterbeck, emailed the Archive to report that recent discoveries have likely pinpointed the date of the mural to the year 1673, and not the 16th century as earlier assumed, and that it was painted by artist Johan Bartsch Jr. The photos seen here were taken by photographer Wolfgang Sauber and found on wikimedia. Link directly to this section about the Gothem church paintings. Here is a close-up detail of the Mohammed figure. According to these two Swedish articles (unfortunately now offline), the Gothem church paintings were undergoing renovation when the Danish cartoon controversy broke, and local experts, fearful that Islamists would attack the church, began to claim that the painting depicts not Mohammed the Prophet, but instead the Ottoman Sultan Mohammed IV (better known as Mehmed IV), who had a similar style of mustache. But Mehmet IV did not become known to most Europeans (especially Europeans as far away as Gotland) until the pivotal Battle of Vienna in 1683, when Christian forces defeated his invading Ottoman army -- ten years after the painting was created. There would be little reason in 1673 for an artist so far removed from the Ottoman Empire to depict a distant political figure unknown to his audience. More likely is that the artist indeed drew Mohammed the Prophet, but sporting the style of mustache that was popular at the time the painting was made. 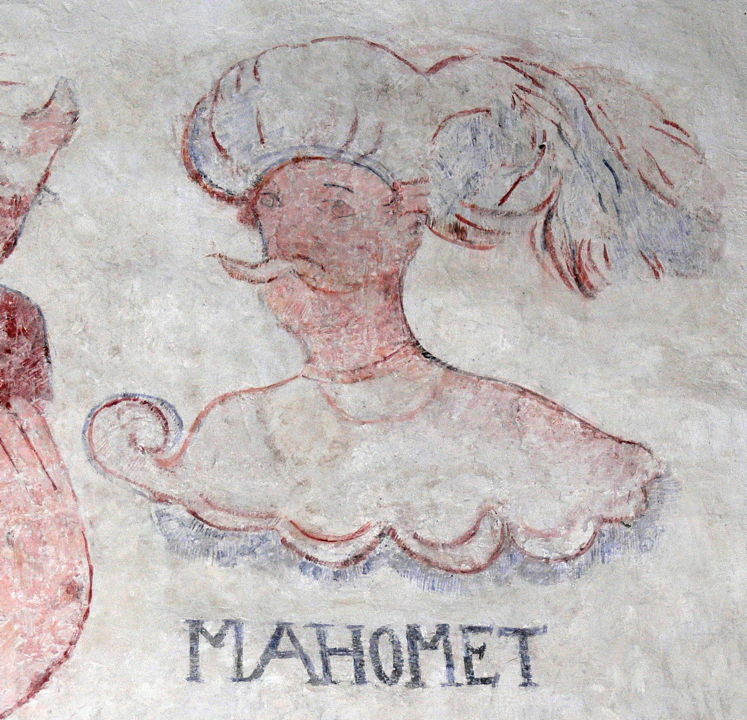 Interestingly, these wall paintings were probably made during the period that Gotland was part of Denmark, making this the original Danish Mohammed cartoon. 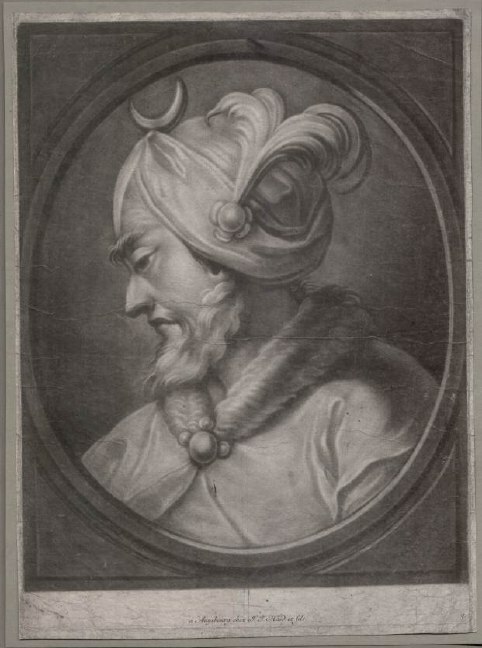 This mezzotint print by German artist Johan-Jacob Haid was made in the mid-1700s, and is almost certainly a portrait of Mohammed. A larger-size image can be seen here. 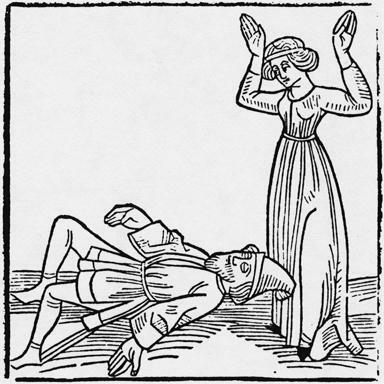 "His Wife Scolding the Drunken Mohammed," German woodcut print, c. 1481. Source (for this image and the one below): The Illustrated Bartsch. Vol. 83, German Book Illustration before 1500: Anonymous Artists, 1481-1482. Series title: Reysen und Wanderschaften durch das Gelobte Land / Travels and Wanderings Through the Holy Land. 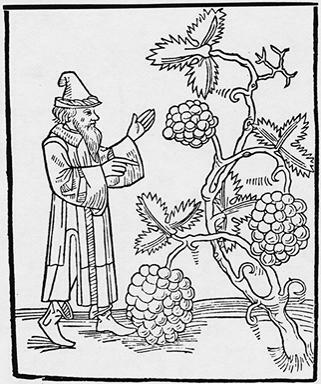 "Mohammed Cursing the Vines," German woodcut print, c. 1481. Presumably Mohammed is cursing the vines for producing the grapes that got him drunk.